Fabian Ruiz's practice is dedicated to the representation of management in labor and employment law disputes. Fabian has obtained successful resolutions on behalf of his clients in single plaintiff, multi-plaintiff, and class and collective actions. He has represented clients before federal and state courts, and before federal, state, and local administrative agencies including the Equal Employment Opportunity Commission, the Florida Commission on Human Rights, and the Miami-Dade Commission on Human Rights. Fabian's background also includes experience in mediation and arbitration, having successfully mediated and arbitrated employment matters from inception to complete dismissal. He has represented employers in a broad range of industries, including extensive experience in the retail, construction, and sports and entertainment industries. 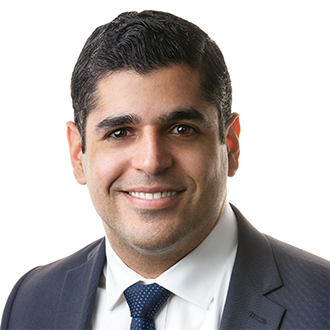 While Fabian is adept at handling litigation and administrative charges for clients, a central focus of his practice is providing preventive advice and counsel. He routinely provides training to employers in both English and Spanish on a host of employment law issues including sexual harassment and discrimination, hiring, discipline and discharge, wage and hour regulations, independent contractor classification issues, and alternative dispute resolution. Fabian is adept at trouble-spotting and has conducted company-wide audits of employee classifications, compensation practices, and equal employment practices. He has also reviewed, drafted, and revised company handbooks to remain compliant with the ever-shifting landscape of employment laws. While in law school, Fabian gained legal experience in both the private sector and the public sector. He served as a summer clerk for a full service law firm and as a judicial intern for Chief Judge Jose L. Linares of the U.S. District Court for the District of New Jersey, and Judge Ivan F. Fernandez of the Florida Third District Court of Appeal. Fabian also served as a legal trainee for the New York City Football Club of Major League Soccer, as a law clerk for the U.S. Department of Homeland Security, and as a legal intern for the Office of the Governor in the state of New Jersey. During law school, Fabian completed a graduate fellowship at the Eagleton Institute of Politics. Successfully defended against employee’s interlocutory appeal of motion for preliminary injunction to the U.S. Court of Appeals for the Eleventh Circuit. Obtained summary judgment on behalf of an international luxury hotel brand on former employee's claims of race, religion, and national origin discrimination and retaliation. Obtained summary judgment on behalf of a large U.S. financial institution on claim by employee of retaliation under Florida’s Private Whistleblower’s Act. Assisted large retail company with enforcement of a non-compete agreement. Obtained summary judgment in arbitration on behalf of architecture firm on former employee’s claim of entitlement to overtime under the Fair Labor Standards Act.